The new year has just begun, which means that it’s time to create resolutions and determine in which areas of your life you want to work on improving. While many feel that resolutions are designed for weight loss and finances, that’s not the case. Creating intentions to improve other aspects of your life is something that you can dedicate to your New Year’s resolutions as well. 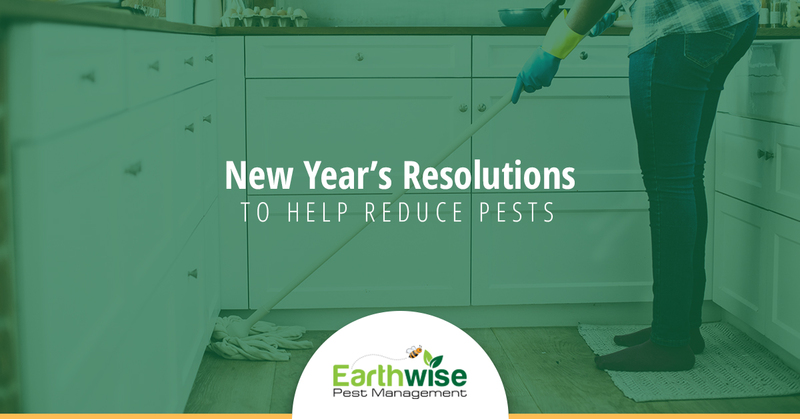 At Earthwise Pest Management, we’d like for homeowners to dedicate time to forming resolutions surrounding pest control and the ways that they can reduce pests in this new year. Our pest management method works by being removing pests and the factors that drew them there in the first place. For these treatments to work, consistent efforts need to be made. In today’s blog, we’re going to talk about a few of the resolutions that you can make in this new year to help reduce the number of pests that you come across. Keep reading if you’re interested in learning how you can dedicate yourself to being a better homeowner in the new year. One of the factors that often attract pests to a space is a mess. Not only do messy areas often provide the security of being left unfound, but they will also usually offer a food and water source for the pest to thrive on. By dedicating yourself to keeping a tidier home, you can drastically reduce the chances of pests ever coming across a mess and finding a space where they can make a home. It’s important to remember that spaces like your garage, attic, and basement are all areas of the home that are often used for storage and can go undisturbed for periods of time. If you know that these areas of your home are spaces where pests have been found before or that there are messes that could provide a safe place for a pest, it’s good to dedicate time to cleaning them up and ensuring that there aren’t any pest infestations already happening. With any resolution that you make at the new year, the most crucial piece to staying true to it throughout the year is dedication and maintenance. When it comes to preventative pest control and minimizing pests in and around your house, a key factor is going to be routine inspections. We aren’t talking about how a pest control professional needs to inspect your house routinely. We are talking about you and your family making a conscious effort to inspect your home regularly. By taking the time and making an effort to inspect your home and the spaces that are likely to have pest infestations (attics, basements, garages, closets, etc.) you are sticking to your intention of reducing pests as a resolution. When paired with everything else that we’ll cover in the blog, there’s a very slim chance that any pest will be able to thrive in your home! Having to deal with pests inside of your home is less than ideal, but the reality is that pests can become equally annoying when you have to deal with them in your yard. While that is the case, keeping pests out of your yard is much more challenging than keeping them out of your home. What most people don’t realize is that there are small things that can attract pests to a yard, making it much easier for them to find a way into your home. That being said, we believe that maintaining your landscape and yard should be a part of your resolution in an attempt to reduce pests. From reducing standing water to trimming trees, you can help reduce pests in your yard. In doing so, you also reduce the chances of seeing them in your home. While not all pest control problems can be prevented, a majority of them can be. Working with your local pest control company is highly suggested when speaking of preventative measures that you can take to reduce the chances of pests. While we appreciate being called to help take care of pest control problems, we also offer consultations and services that can help prevent pests in the first place. If you’re genuinely making a resolution to reduce pests, count on your local pest control company. Not only in the times where there’s already a pest infestation to take care of, but for assistance, guidance, information, and more. In this new year, make a resolution to make use of the knowledge and experience that your local pest control company has to offer. Earthwise Pest Management is proud to provide the Sacramento area with high-quality pest control services. If you’re in need of assistance with an infestation or you’re interested in learning more about the integrated pest management approach that we take, reach out to our team today. We would be more than happy to assist you!